The Perfect Winter Meal | welcome to the janniverse. Most people say comfort food is whatever they grew up with. That may be true in a lot of cases, but I find a nice bowl of oyakodon (or most types of don, really) to be incredibly comforting. And I assure you, I never had it until I was out of high school. 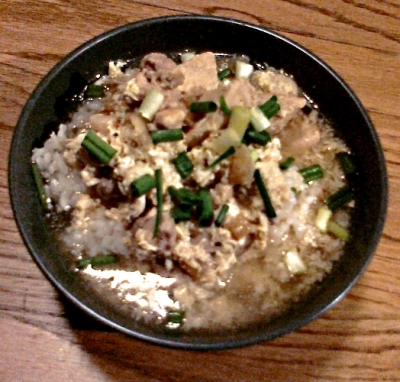 Oh, oyakodon, what would I do without you? Oyakodon is a popular Japanese one-dish meal, and basically just means “parent-and-child bowl.” The most common one you’ll find is chicken and egg, as I’ve made above. But you can really use any parent-and-child combo you find appropriate, like salmon and salmon roe. I suppose beef and veal could qualify, too. And you always need eggs. Mmm, eggs. You can also add whatever vegetables you like to it, although I usually stick with the simple classic and caramelize a bunch of thinly sliced sweet onions, cook my meat, make my broth (dashi-based, seasoned with soy sauce and mirin), and slice my green onions. And of course, beat my eggs and pour them over when the meat’s cooked and the broth is boiling. Served over fluffy, hot white rice, this is absolute heaven when it’s cold out. …And then, there was cake.